My first infatuation was with Sudoku. Then my attentions moved to Kakuro. Now, though, I have a big crush on KenKen. No, I'm not talking about marital infidelity involving various Japanese women. I'm talking about a series of logic puzzles that have made their way from that country to U.S. newspapers, Web sites, and mobile phones. 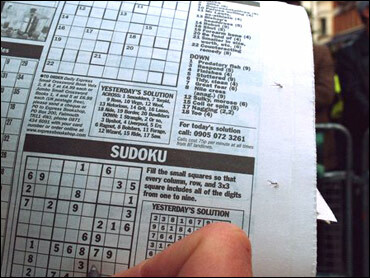 Though Sudoku certainly hasn't reached the level of ubiquity of crossword puzzles, it is certainly widespread. The 9-by-9 grids -- each of the 81 cells must be populated with the numbers 1 to 9, according to the rules -- can be found far beyond newspaper pages. Airport books promote the puzzles to travelers who need to kill time, and you can even pay for a four-week Sudoku course. Logic is swell, but I like math -- at least until my brain pooped out in college upon reaching differential equations -- and Sudoku is just a logic puzzle. Sure, it has numbers, but you could just as well use nine different colors, letters, or other symbols. Enter Kakuro, which I discovered in The Detroit Free Press. With this puzzle, you have to figure out how to fill in a sparser pattern of squares so that cells grouped into various horizontal or vertical lines add up to a specific total. Each group may not have any repeating digits, so for example a line of four boxes totaling 11 must have the numbers 1, 2, 3, and 5 in some arrangement. Likewise, a group of two boxes with a total of 4 must have a 1 and a 3, but you don't initially know which goes where. After a year of doing Kakuro, though, the puzzles grew a little mechanical. It still can be a challenge to spot the constraints, figure the possible combinations, and make the necessary deductions, but I no longer eagerly seek out fresh Kakuro puzzles online or in the daily paper. To be fair, I've found that ATK Solutions' Kakuro puzzles evidently are created with a different algorithm that can offer a much bigger challenge. But I spend hours glued to computer screens all day, and I enjoy the paper-based puzzles, especially when stuffed into a commuter train. Happily, just as I was getting disillusioned with Kakuro, KenKen stepped into my life. It arrived in the form of a book--a review copy of Will Shortz Presents KenKen Easiest Volume 1 from St. Martin's Press. It is written by Shortz and Tetsuya Miyamoto, the Japanese math teacher who invented KenKen. "Ken" means wisdom in Japanese, thus KenKen means wisdom squared--or perhaps cleverness squared, depending on your translation. It took me about 30 seconds to grasp the rules of KenKen and another 30 seconds to get sucked into the book. Shortz, The New York Times' crossword puzzle editor since 1993 and probably the most famous puzzle guru around, praises KenKen as a puzzle that's easy to learn yet spans a range from simple to very difficult, and he's right. Here's the basic KenKen description: It's got square puzzle grids -- 3x3 is the easiest, and the largest I've tackled is 9x9. In general, the larger the grid, the harder the puzzle, though several other elements factor into the difficulty. As with Sudoku, each horizontal row and vertical column gets each number exactly once, but you have to figure out the proper places. With a 3x3 grid, each row and column has the numbers 1, 2, and 3. With a 6x6 puzzle, the numbers range from 1 to 6, and so on. So where's the math fit in? Various groups of boxes are surrounded by a bold line, called a cage. A cage can be horizontal or vertical, but it also can span multiple rows and columns if it's L-shaped or square, for example. Each cage contains a number and the mathematical operator. To fill the cells in the cage, you must combine the numbers in the cells using the operator. For example, a two-cell cage with the number 3 and a plus sign means that the two unknown numbers must be added together to produce 3. That means one is a 1 and the other a 2, but you have to figure out which goes where. Kakuro fans will have to un-learn the rule that trains you to break down sums into unique numbers. In both KenKen and Kakuro, with three cells in a row adding to 6, the only possible numbers are 1, 2, and 3. But with a three-cell, L-shaped cage in KenKen, you also must consider the possibility of 1, 1, and 4. Add multiplication into the mix, and you start grappling with prime factors. I was thrown off by one puzzle where three cells in an L-shaped cage multiplied to 192, thinking it had to be 8 times 8 times 3, but then I realized my error: another combination was 4 times 6 times 8. And don't forget that 1 is another prime factor! Including a wider range of operators can make things harder, but even puzzles with only addition and subtraction can be a good challenge. In the harder puzzles toward the end of the book, I twice had to resort to my last-ditch technique, speculative methods: supposing this cell has a 2, then that one must have a 1, etc., until I reached a contradiction or solution. The hardest puzzles add a major new wrinkle. They don't tell you which mathematical operator you need to use, so there's an extra layer of deduction required. The third puzzle in this story is an example. After more than an hour and a half wrestling with it, I filled in 20 numbers--and found I'd made a mistake. Back to square one. I gleefully polished off the book by Miyamoto and Shortz in my spare time over a few days. I was left wanting more. Happily, KenKen puzzles can be found elsewhere, too, as they follow the import trail blazed by Sudoku. KenKen's U.S. launch came in October after Nextoy President Robert Fuhrer signed up for licensing and marketing rights outside Japan. The New York Times started publishing KenKen puzzles online in November, and The Boston Globe, The Houston Chronicle and other papers have signed up as well. Right now, though, The New York Times' online interface is weak. Unlike with online Sudoku and Kakuro games, there's no ability to include all the possible numbers with small figures, only to add the final large number. That's fine for easy puzzles but not hard ones. So there are plenty of ways to get cracking to warm up for the KenKen tournament that Nextoy is planning for next fall. Anybody up for an iPhone app? Miyamoto created KenKen to be a multifaceted challenge, and indeed I find them a great mix of logic and manageable math. They're entertaining yet provide a slightly smug feeling that they're good for your mind, too. I know math puzzles aren't for everyone, but I highly recommend KenKen. I'm giddy with the anticipation of the ones I'll tackle in the future -- or at least until my attention is grabbed by something else. Stephen Shankland covers Google, Yahoo, search, online advertising, portals, digital photography, and related subjects. He joined CNET News in 1998 and since then also has covered servers, supercomputing, open-source software, and science.